Sessions 1 and 2 should be divided into four 30-minute periods. These sessions introduce your teen to the instrument panel, vehicle controls, and mirror blind spots. Please review the vehicle owner’s manual before and during these sessions. You will need a measuring tape, cones, or plastic cups to use in these and future lessons. Begin in a large, level parking lot free of obstacles. Use the checklist on the next page to help organize your lessons and assess learning during the second half of session 2. Prior to entering the vehicle, the teen should check for fluid leaks, broken glass, objects behind the vehicle, etc. Check tire pressure, engine oil, radiator, and other fluid levels. Enter the vehicle and review interior controls; turn on the ignition switch to discuss functions of lights, gauges, and accessories. Ask your teen to operate and explain all controls and to simulate monitoring the path ahead while operating the controls. Discuss how the proper seating position is essential for control of the vehicle. The driver should sit with his or her back firmly against the seat with at least 10 inches between the steering wheel and the driver’s chest. The air bag should point towards the driver’s chest. The top of the steering wheel should be no higher than the top of the driver’s shoulders. Adjust the seat to maintain heel contact with the floor to pivot the foot between the brake and accelerator pedals. Short drivers may need a seat cushion or pedal extenders to sit in a safe position at least 10 inches from the air bag. 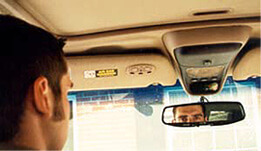 Adjust the head restraint to align with the center of the back of the driver’s head. Adjust the inside mirror so that it frames the entire rear window and is the primary mirror for viewing traffic behind the vehicle. Adjust side mirrors to reduce side mirror blind spots and headlight glare from the rear. Seat belts must be worn properly to prevent injuries. The lap portion should be snug across the hips, and the shoulder portion should be worn snug across the chest away from the neck and face. Improper use may cause injuries. Practice starting the vehicle and adjusting accessories. The following exercise illustrates the area around the car the driver cannot see. While your teen is sitting in the driver’s seat with the engine off, get out of the car and stand close to the front bumper facing your teen. Begin taking steps backward and ask your teen to tap the horn when he or she can see your feet. Place a cone or cup in that spot. This is the pavement area in front of the vehicle that cannot be seen from the driver’s seat. Ask the driver to use the inside mirror and/or to look over the right shoulder, and repeat this process to the rear of the vehicle. Walk backwards from the passenger doors on the left and right sides of the vehicle and place cups or cones to mark the side areas visible to the driver. Ask your teen to measure and record these distances on the next page. With the right foot firmly on the brake, have your teen shift through the gears and explain when each gear is used. If the vehicle does not have daylight running lights, turn on the low-beam headlights. Press the brake pedal, release parking brake and shift to drive. Ask the new driver to move the vehicle to different points in the parking lot using little to no acceleration. Have your teen stop at designated lines. Focus on smooth acceleration and stopping. Ask your teen to drive around the perimeter of the lot and focus on push-pull-slide/hand-to-hand steering. Coach your teen by saying “slow” until the vehicle comes to a stop. Once you have developed that skill into a habit, progress to saying “slow to a stop”. Use the command “stop” only when you need your teen to make a hard, emergency stop. Treat these practice maneuvers as simulating stopping and turning at an intersection. Using commentary driving, ask your teen to say, “clear left, clear right, clear left, clear ahead” from a stop and “clear left, clear right, clear ahead” while moving. Make sure your teen signals and checks mirrors and blind spots prior to changing speed, position or direction. Focus on continuous and smooth steering wheel movements into the turn, and returning (sliding) the wheel through the hands using the same smooth continuous movements until the vehicle is in the proper position in the lane. 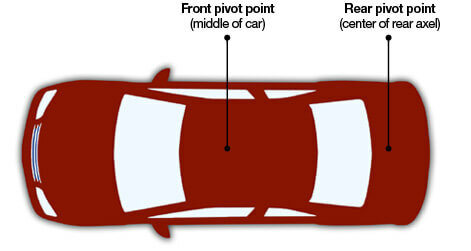 Discuss the vehicle’s forward pivot point, which on most cars is even with the driver’s body. Coach your teen to focus on looking at and steering towards a target in the center of your intended path of travel. Approaches the vehicle with awareness; checks tires, fluid leaks, etc.